As famed Road & Track columnist Peter Egan once joked, sadly there’s no relationship between your driving instructor’s race record and your own competition success. I know that all too well. When I graduated from college, my parents gave me perhaps the best present ever: a half-day session at the Skip Barber Racing School. I was going to drive a real, live formula car. If I remember correctly, that visit counted for pretty much every other holiday present that year, too, and I didn’t care. I was going to drive a race car on a race track. When I got there, I received a bonus: My instructor would be Boris Said (yep, the same guy who happens to be our guest of honor at the upcoming Mitty). We spent the morning do lead-follows. Boris was in a BMW 3 Series, while I did my best to keep my green single-seater on the pavement. My parents rode shotgun with Boris, and afterward he took the entire family out for a spin. I sat in the passenger seat and watched him easily click off perfect laps–on the same track I had just bumbled my way around minutes before. Boris appeared to have three hands: one on the wheel, one shifting gears, and another clutching a walkie-talkie. Meanwhile, he was holding two conversations simultaneously, one with us and one with the voice on the other end of the line. How did I luck out and get instruction from someone who has made such a mark in so many venues, including IMSA, NASCAR, Trans-Am, World Challenge, SCCA, American Le Mans and even the Nürburgring? Well, at the time his star was just rising. That Skip Barber school took place back in 1992, a few months after I hung off the fence and watched him win his third consecutive Showroom Stock GT national title. This was back when an SCCA Showroom Stock title was seen as a springboard to the professional ranks. You could call me a bit star-struck. Quick side note: The track that hosted my Skip Barber school was Bridgehampton. Once a stop on the Can-Am and Trans-Am circuits, this famed Long Island facility was replaced by a golf course a decade and a half ago. Since that first meeting, Boris and I have kept in touch through regular encounters at the track. Several years ago he spoke before a meeting hosted by my parents’ BMW club, and the next time I saw him he playfully slapped me across the face before telling me to call my mother more often. He didn’t even bother to remove his gloves or helmet before passing along that message. Most recently we sat at the same table during a dinner hosted by the Road Racing Drivers Club, a who’s who of sports car racing. Vic Elford was the guest of honor, but Boris kept a running commentary throughout the evening. Glad we were all sitting at the kids’ table in the back corner of the room. I’m still a fairly average driver, but Boris has become a legit racing hero. He even has his own unofficial fan club of Said Heads. They wear fake afros in homage to Boris’s unruly locks. Soon after scoring those SCCA championships, he went pro full time. Reeves Callaway tapped Boris to drive turbocharged Corvettes worldwide, and during the middle of the ’90s the team made a mark at places like Daytona, Le Mans, Spa and the Nürburgring. From there Boris moved to BMW, where he helped the factory-backed PTG team win Daytona in 1997 and 1998. They won Sebring that second year, too. Boris hasn’t limited himself to sports cars, either. He dipped a toe in the NASCAR waters in 1995, quickly becoming known as one of the road course ringers. Two years later he had a full-time gig in the NASCAR truck series. He’d move around through the NASCAR ranks–not a champ but always there, especially on tracks with rights and lefts–and in 2006 he famously scored the Pepsi 400 pole at Daytona. No pavement? No problem. The guy has raced at Baja and even made a rally appearance at the X Games. 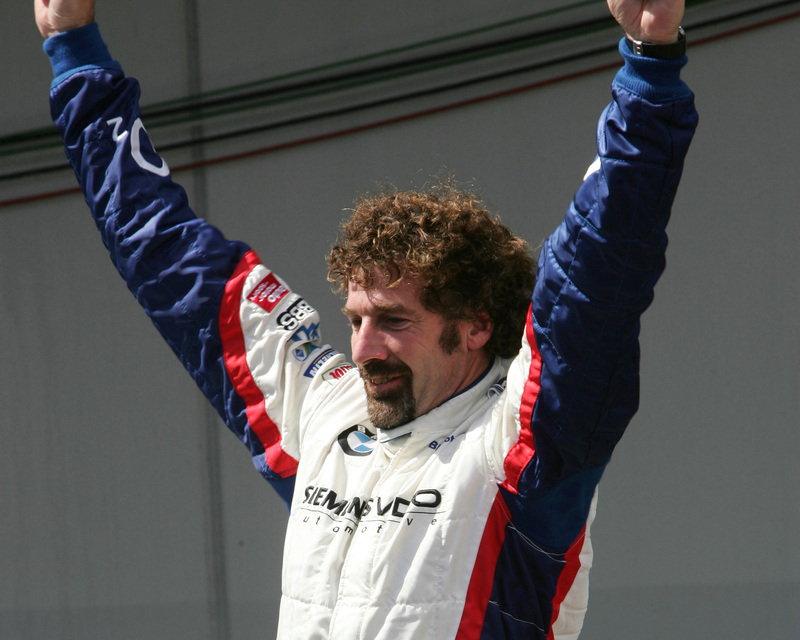 Other standout achievements: In 2002 he won eight of 11 races to become the SCCA Trans-Am champion, and three years later he became the first American to win the 24-hour race at the Nürburgring. He has also driven in the Australian V8 Supercar Series and German ADAC Cup. The guy is an entrepreneur, too. He has run his own teams and co-owns K1 Speed, a chain of indoor kart facilities. Recently he opened BMW of Murrieta, giving California’s Temecula Valley its own dealership. In the ’60s and ’70s we watched guys like Mario Andretti, Mark Donohue and A.J. Foyt jump between venues–NASCAR one weekend and Indy or endurance races the next. In today’s age of specialization–and risk management– Boris may be the closest thing we have to those throwback jacks-of-all-trades. If you’d like to meet a real racing superhero, join us at Road Atlanta the last weekend of April. And maybe some of that driving skill will finally rub off. NASCAR Road Racer in 1995? Seems like yesterday I was watching that on TV. I agree and didnt have a chance after my Skip Barber. Bruce MacInnes, Duck Waddle, Terry Earwood and Jeremy Dale at Sebring in 1988 for a 3 day school. I was in total amazement the whole weekend. Back in '79 I think it was I did a 3 day Skippy school at Mid Ohio. Bruce MacInnes was my instructor. I caught up with Bruce last year. I called him out of the blue once I found his website. He still does some driver coaching but has other interests other then motorsports. I got to ride shotgun with Boris at Putnam Park Road Course in a supercharged Mustang GT. It was impressive to watch him work. First SCCA driver school in a D/SR at Mid-Ohio in the spring of '89. Driving instructor was Michael Shank, S2 National driver then. He went on to better things and success. @ David: I think everyone remembers there first. I have had many instructors over the years. Some have gone on to be famous. I had one by the name of Ed Tinsdale (sp). That I will never forget. Best instructor I ever had. That was almost 30 years ago. The one I remember with Ed was after a couple of laps we started talking about what each of us did for work and other stuff completely unrelated to racing and I then proceeded to click off my fastest laps of the weekend. Learned a Huge lesson that day. Relax and don't over drive the car. That lesson has stuck with me and helped me many many times. I'm pretty sure I peeled Boris's name off some TransAm bodywork in 1999 from where he'd driven the car in 1998. I don't remember if he drove one of our cars that year or we just saw him a lot in the paddock. Always seemed like a fun and cool guy. In 2000 I worked with a guy who was Boris's instructor at a driver school many years earlier. He said he took one lap with him and basically signed off on his license. "There's nothing I can teach him" or something to that effect. Cool, glad you guys enjoyed it. Thank you. I saw Boris last year fall at the Hilton Head Concours. Nice to see him getting his due. My first track experience was a 3 hour Skippy School at Bridgehampton in the early 90's. After the classroom session, one of the instructors took us all out on the track in a tired old 3 or 4 row full size Dodge van, ostensible to demonstrate braking and turn in points etc. Well that nutter bombed the track, with a full load of us flailing around in the bench seats. "I do that lap time in a van" indeed. A short time later I'm sitting in the Skippy Formula Ford, engine idling, and all sort of bits rattling, excitedly waiting to go on track, and this mop head dude straddles the nose of the car, looks me square in the eye, and shouts "NO GUTS, NO GLORY!! ", as his clenched fists hit the top of my helmet.